We Need Treatment -- Now! The shutdown of a well. A change in process water quality requirements. A maintenance shutdown at the local water treatment system. These scenarios require immediate action from municipalities and such end users as power plants, refineries, and chemical plants. Communities expect safe drinking water and clean water to do business. Water treatment plants are designed to provide that commodity but unforeseen situations often arise. When those problems present themselves, managers can turn to mobile water treatment. It offers a quick, cost-effective solution: A phone call to a mobile treatment provider sets the wheels in motion, literally. Mobile treatment assures municipalities and industrial plants of obtaining a specific quality, quantity, and cost of water with no capital investment and the option of a support and service team on call 24 hours a day. The current mobile treatment market includes such systems as clarification, filtration, deionization, and reverse osmosis (RO). Clarification often is used to treat cloudy water or highly turbid water caused by floods. Mobile clarifiers can be self-contained, trailer-mounted units capable of treating water with turbidities up to 1,000 nephelometric turbidity units (NTUs). Some systems can produce very clear effluent (0.5 to 1.0 NTU) with high stability under varying raw water conditions. These systems can be used alone or combined with mobile filtration. Filtration systems configured with softening, greensand, or multi-media units can treat red water problems caused by high iron or manganese concentrations. Systems equipped with granular ferric hydroxide adsorptive media can remove arsenic. Organic contaminants, including those that cause taste and odor problems or health concerns, can be treated with activated carbon. For dissolved ions such as nitrate, perchlorate, and lead, a mobile demineralization system should be used. Separation systems are another useful mobile technology used to remove dissolved ions. This self-contained system incorporates pretreatment and reverse osmosis. It can produce 200 gallons per minute of low-conductivity product water under various raw water conditions. A separation system trailer can contain multi-media, carbon, or softening pretreatment equipment to remove common impurities in raw water. Mobile RO systems may contain instrumentation and equipment for fully automatic and monitored operation. Even microbial contamination issues, such as coliforms, Giardia lamblia and Cryptosporidium, can be solved using a combination of mobile technologies and disinfection procedures. With all these treatment choices, where does a manager start? It is best to research the mobile water treatment vendors and find out what equipment and services they offer, and then make contact to see if they can meet the specific application requirements. The vendor typically will ask these questions to determine how best to treat the water problem. What is the quality of the source water and are there already any processes onsite to pre-condition the water? What finished water quality will the plant need? Does the plant have storage capacity? If so, the trailer can have a smaller average flow rate than if there is no storage tank on site. How long will the plant need the treatment equipment? How far away is the site? Will the plant operate the equipment or does it want the vendor to operate it? As for determining the quality of the source water, either the water treatment vendor or a plant's chemical provider can analyze the water. Once all the relevant questions are answered, the vendor can discuss options and recommend the best technologies for the job. The following case studies show how mobile treatment from Siemens Water Technologies has provided solutions for some municipalities and industrial plants. The Cucamonga Valley Water District (CVWD) receives a large portion of its water from the Los Angeles Metropolitan Water District (MWD). When MWD managers determined that there was an imminent chance of failure in the supply line to the city, they notified the CVWD and ordered a supply shutoff so repairs could be made. The CVWD had two choices: bring its nitrate-contaminated wells back online to make up for the shortfall or impose severe water rationing on the community. In June 2005, Cucamonga Valley decided to treat the well water, using two mobile demineralizer trailers at the well site. The trailers used a new NSF International-approved anion resin in chloride form in the ion exchange process. Within hours of startup, the effluent level of nitrate in the well water was less than 5 parts per million, which met regulations. When the resin was exhausted, another trailer was placed in service without interrupting the process and thereby keeping CVWD well supplied. CVWD did not have to resort to water rationing. Similarly, the Apache Junction (Ariz.) Water Utilities Community Facilities District faced a potable water shortage when its highest-producing well collapsed, an arsenic-contaminated well treatment system was behind schedule for maintenance, and there was a scheduled maintenance shutdown for a treatment plant that supplies much of the city's water. The district's options included buying additional water from other sources or trucking in water to the site. When field personnel mentioned portable treatment, the district contacted a vendor. They ultimately chose mobile clarification and horizontal filter technologies. The vendor delivered the trailers, along with the required pipes, pumps, and tanks, and started up the equipment in just a few weeks during the December 2005 holiday season. "Here we were, faced with a lack of enough potable water for the city's 19,000 residents, when the greatest miracle in water treatment history happened," says Brian Hall, operations manager at Apache Junction Water Co. "We had water in three-and-a-half weeks whereas a permanent system would have taken a year. The Arizona DEQ (Department of Environmental Quality) gave the technology its blessing?.," Hall said, adding that the raw water turbidity is 11, and the contract specified 0.5. "The system is actually producing more like 0.1 or 0.2." Seven hundred gallons per minute of water from the Central Arizona Project Canal is pumped to the mobile clarifier for treatment and transferred to a 21,000-gallon storage tank, where it is re-pressurized and fed to a horizontal filter trailer and processed before being re-pressurized again and sent to two 21,000-gallon portable tanks. The water is then pumped to the city's distribution system. The vendor handles the operation and maintenance on the mobile equipment, and the district maintains its tanks and pump. The mobile trailers operated for more than three months until the collapsed well was replaced and the potable water shortage was over. Rosemount, Minn., was experiencing a problem in 2004 with effluent quality from its wastewater treatment plant. The 0.75-million-gallon-per-day (mgd) aerated lagoon was permitted to discharge wastewater with a maximum average monthly total phosphorus level of 1.0 milligram per liter (mg/l). Effluent from the facility's newly installed disc filters was exceeding the National Pollutant Discharge Elimination System permit limit. The disc filters had been installed to remove total suspended solids and associated phosphorus. Soon after the disc filters were placed online, however, the plant's operators determined that the phosphorus reduction was inadequate. Plant engineers sent a feed water sample to the vendor for testing, which verified that the soluble and insoluble phosphate were attaching to suspended particles in the water. These particles were not being removed efficiently from the waste effluent. In the winter, the temperature of the aerated lagoon can drop below 3 degrees Centigrade, inhibiting suspended solid flocculation. Thus, small particles were passing through the 10-micron disc filters. In warmer weather, as the water temperature rises, the solids become larger and the filters are able to remove them. The vendor suggested high-rate mobile clarification for removing the suspended solids. It delivered a clarifier trailer to the site, and then made modifications so the system would withstand temperatures as cold as -12 degrees Centigrade and winds of 60 miles per hour. Four days after the clarifier was placed online, the total phosphorus level of the treated effluent was 0.75 mg/l, below the permitted 1.0 mg/l maximum. The facility met the conditions of its permit the following month. The trailer operated continuously for three months until the weather warmed up and the disc filters were able to remove the suspended solids. The Piney Point fertilizer plant in Palmetto, Fla., was the site of 1.2 billion gallons of acidic, ammonia-laden process water that was held in a series of ponds. After heavy rains, the ponds were in danger of overflowing, spilling contaminated water into Tampa Bay. The plant had been inactive since 1999 and, following bankruptcy filing by the parent company in 2001, was taken over by the state government to oversee closure. The plant had used millions of gallons of water to produce phosphoric acid, solid phosphate, and ammonium phosphate fertilizers. The water used in production was managed on the property through a series of large ponds and canals that acted as process make-up water and a heat sink for operations. When the plant stopped operating, rainwater collected in the ponds and threatened to overflow. The contaminated water needed to be treated and discharged or transferred offsite. The state organized a team to manage the site and selected wastewater treatment and offsite disposal methods to solve the problem. In May 2002, the vendor received a two-year mobile service contract to support the Florida Department of Environmental Protection's remediation initiative for the fertilizer plant. The service contract was based on performance with guarantees on discharge water quality following the treatment process. The vendor had to manage treatment system scaling from the high total dissolved solids content and low pH of the wastewater. The final treatment scheme included high-rate clarification followed by filtration, RO, and demineralization that treated up to 1 mgd of brackish, acid pond water, making it pure enough to discharge into Tampa Bay. This solution featured a patented clarification process that had not been used previously as the treatment standard for this type of wastewater. The state reduced the volume of wastewater at the site and ultimately brought closure to a serious environmental issue. Charles (Chuck) McCloskey has served as the market development manager for Siemens Water Technologies mobile services since 2005. 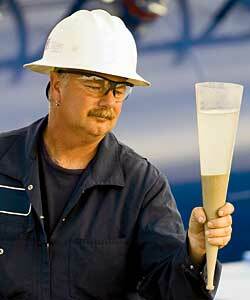 He has been providing solutions to industrial water treatment customers for more than 30 years. He has a BA degree in biology from Slippery Rock University in Slippery Rock, Pa., and studied for his MBA degree at Keller Graduate School of Management in Chicago.